Found her on the 1850 New York, New York census (Ward 11 img 251) as Elizth Fenwick age 24. Found her on the 1870 Brooklyn Ward 7, Kings, New York census (img 240) as Elizabeth Fenwick age 44. Found her on the 1880 Brooklyn, New York, New York census (dist 160 img 45) as Elizabeth Fenwick age 54. Found her on the 1910 Liberty, Wood, Ohio census (dist 193 img 10) as Percy B. Finger age 35. Found her on the 1860 Vernon, Clinton, Ohio census (img 15) as Jane Austin age 11. Found her on the 1900 Duke, Greer, Oklahoma census (dist 82 img 39) age 10. Found on the 1855 Gallatin, Columbia, NY census as Lovina, age 36. Found him on the 1920 Penn Yan, Yates, New York census (dist 182 img 10) as Milford Danes age 25, truck driver, Standard Oil. Father, mother born New York. Found him on the 1930 Torrey, Yates, New York census (dist 19 img 6) as Milford W. Danes age 35, driver, oil co.
PENN YAN - There was a private prayer service for William H. Disbrow, 76, of Bluff Point RD 1, who died Monday, at 2p.m. toady in the Wade Logan Funeral Home. The Reverend William Kirkpatrick, rector of St. Mark's Episcopal Church, officiated. There will be a memorial service at the church at the convenience of the family. The family has requested that memorial contributions be made to Soldiers and Sailors Memorial Hospital. Born in Hopewell Center, a son of George and Susan Welcher Disbrow, he had lived on his Bluff Point farm for 45 years. He was a member of the Episcopal Church and Milo Lodge 106, F & AM. Survivors are his wife, Lucy Copson Disbrow; two daughters, Mrs. Marie Titus of Branchport and Mrs. Margery Brown of Penn Yan; two sons, David of Bluff Point and Van of Branchport; a sister, Mrs. Maude Habberfield of Penn Yan; and 15 grandchildren and several nieces and nephews. Father: Clyde Miller FINGER Sr.
Found him on the 1930 Bethel, Fairfield, Connecticut census (dist 98 img 18) as Donald G. Finger age 2. Living in Queen Creek, AZ in 2007. - Sister Frances' obituary. Found her on the 1870 Caldwell, Catawba, North Carolina census (img 20) as Dorah Finger age 5. Found her on the 1880 Caldwell, Catawba, North Carolina census (dist 44 img 5) as Dora J. Finger age 15. He and his brother Adam died in the same month and year. He died of pneumonia - 1880 Gallatin, Columbia, New York mortality schedule. He lives next door to his brothers Philip, Peter and Michael. Living in the same house, Alfred Fries, age 11, servant. Found on the 1860 Gallatin, Columbia, New York census (img 34), household 855, age 50. Living in the same house, Alfred Friss, age 15, farm laborer and John Friss, age 8. Found her on the 1880 Honeybrook, Chester, Pennsylvania census (dist 102 img 23) as Lilla Finger age 10. Found her on the 1900 Camden, Camden, New Jersey census (dist 35 img 13) as Lila Finger age 29, single, a boarder along with her sister Ida in the household of her sister Bessie and her husband Frederick Asimas. Found her on the 1930 Mineral Wells, Palo Pinto, Texas census (dist 13 img 26) age 4. Found her on the 1880 Greenfiled, Milwaukee, Wisconsin census (dist 88 img 5) as Louisa Finger age 10. A Dresden motorist, a Penn Yan teen-ager, two passengers who escaped injury and the Penn Yan Fire Dept., all played a part in a one car accident that occurred at 12:30 a.m. Sunday on Rt. 14 just outside the northern limits of Penn Yan. Marshall Finger, 20, of Franklin St., Dresden, the operator of the car was taken to the Soldiers and Sailors Memorial Hospital suffering from minor injuries and was held overnight. Deputy James Harris of the Yates County Sheriff Dept., assisted by the Penn Yan Police Dept., reported that Finger had been operating his car at an estimated speed of 80 to 90 miles per hour when it went out of control. This caused the vehicle to skid approximately 500 feet then go down a 20-foot embankment. This made the car fly through the air for about 33 feet until it came to rest against a tree. In his mother's obituary (2009) he is referred to as Marshall Finger of Winter Park, Fla.
Father: William Augustus FINGER Jr.
Found him on the 1900 Justice Precinct 2, Tarrant, Texas census (dist 110 img 15) as Bill Floyd age 45, farmer. Found him on the 1910 Mosley, Murray, Oklahoma census (dist 206 img 5) as William W. Floyd age 54. Father born Tennessee mother born South Carolina. Found her on the 1900 Canaan, Columbia, New York census (dist 3 img 19) as Edith M. Fowler age 9. Found her on the 1920 Canaan, Columbia, New York census (dist 5 img 3) as Edith M. Jewett age 30. Found her on the 1930 Tupper Lake, Franklin, New York census (dist 3 img 14) as Edith M Jewett age 36. Kenneth G. Fraleigh, aged 21 years, son of Mr and Mrs William H. Fraleigh, of Clermont, passed awaf at the home of his parents Wednesday night after an illness of but two days from pneumonia. He was a very popular young man whose manly traits of character won and held for him many friends who will learn of his death with sincere regret. Besides his parents he is survived by six brothers, Floyd, Russell, Cecil, Woodrow, Berton, of Clermont, and William, of Hudson; and three sisters, Mrs Myron Rightmyer, of Hudson, and the Misses Maude and Ethel, of Clermont. The Columbia Republican April 16, 1918. Found him on the 1900 Clermont, Columbia, New York census (dist 10 img 11) as Kenneth P. Fraleigh age 4. Found him on the 1910 Clermont, Columbia, New York census (dist 9 img 8) as Kenneth G. Fraleigh age 14. Found her on the 1880 Milo, Yates, New York census (dist 220 img 24) as Harriet Law age 42. There is no husband listed and she and her daughter Nellie Law are living with her parents. Found her on the 1900 Penn Yan, Yates, New York census (dist 142 img 28) as Harriet M. Law age 62, widow, living alone. Found her on the 1910 Penn Yan, Yates, New York census (dist 179 img 3), as Harriet M. Law, age 72, widow, living in the household of David and Mary Finger. Found him on the 1840 Potter, Yates, New York census (img 11) as P. G. Hoeltzel. Found him on the 1850 Highland, Defiance, Ohio census (img 3) as Philip G. Hoatzel age 47, farming, born France. Found him on the 1860 Highland, Defiance, Ohio census (img 3) as Philip G. Holtzel age 57, farmer, born France. Found her on the 1930 Saugerties, Ulster, New York census (dist 52 img 7) as Dorothy M. Houck age 22, single, living at home. Found him on the 1870 Camillus, Onondaga, New York census (img 36) as John Hudson age 4. Found him on the 1860 Sodus, Wayne, New York census (img 44) age 4. Found him on the 1870 Sodus, Wayne, New York census (img 40) age 14. Found him on the 1900 Germantown, Columbia, New York census (dist 13 img 28) as Morris Miller age 36, fruit grower. Found him on the 1910 Germantown, Columbia, New York census (dist 17 img 8) as Morris Miller age 55, farmer, fruit farm. Father, mother born New York. 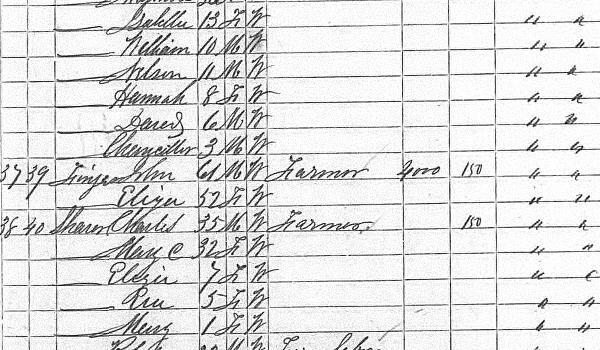 Found him on the 1930 Germantown, Columbia, New York census as Morris Miller age 65, farmer, fruit farm. His wife Margaret, the mother of Betty Race, died in 1926. He remarried Nellie some time between 1934 and 1940. Found him on the 1910 Pulteney, Steuben, New York census (dist 153 img 17) as Vincent Race age 7. Found him on the 1920 Penn Yan, Yates, New York census (dist 183 img 17) as Vincent Race age 17. Found him on the 1930 Milo, Yates, New York census (dist 3 img 18) as Vincent Race age 27, widower. He is a roomer in the household of Clara Townsend age 75, widow. Found him on the 1940 Jerusalem, Yates, New York census (dist 62-14 img 16) as Vincent Race age 37. Mechanic, well driller. Found him on the 1930 Farmington, Ontario, New York census (dist 18 img 5) as Louis E. Record age 3 years 2 months. Found her on the 1900 Ivy Hill, Haywood, North Carolina census (dist 28 img 15) as Annie Rich age 11, born August 1888. Found her on the 1910 Ivy Hill, Haywood, North Carolina census (dist 64 img 7) as Eliza Caldwell age 22. Found her on the 1920 Cataloochee, Haywood, North Carolina census (dist 67 img 2) as Eliza Caldwell age 28. The birth record of her daughter Rebecca names her as Esther Tartakovsky, age 25. The birth record of her son Matthew names her as Esther Dardakofsky, age 25. The birth record of her son Aaron names her as Hesther Dattakofsky, age 20. Found her on the 1900 Wilmington Ward 5, New Castle, Delaware census (dist 18 img 7) as Esther Finger age 29. Has given birth to 5 children, 5 are living. Found her on the 1910 Wilmington Ward 5, New Castle, Delaware census (dist 32 img 10) as Esther Finger age 39, widow. Some time before 1920 she married Joseph Lichtenbaum. DUNDEE, Oct. 6 - Miss Helen Dennison, daughter of Mr. and Mrs. William Dennison, of Spring street, Dundee, is a patient in the Soldiers' and Sailors' Memorial Hospital at Penn Yan following an automobile accident Sunday night at the top of the Main street hill, Penn Yan. Miss Dennison is suffering a possible fracture of the skull, severe lacerations and bruises about tha face. Her condition is serious. Miss Dennison was a passenger In a machine owned and operated by Francis Tears, son of Mr. and Mrs. Frank Tears of Penn Yan. Wlllard Newby, son of Mrs. Maude Newby of Penn Yan, was also a passenger In the Tears machine. It is believed that the glaring headlights of an approaching automobile blinded the driver of the Tears car, which caused the machine to leave the road and crash Into a pole. Found him on the 1910 Penn Yan Ward 5, Yates, New York census (dist 180 img 6) as Francis Tears age 1 month. Found him on the 1930 Maiden, Catawba, North Carolina census (dist 22 img 8) age 31, cotton mill. Found him on the 1910 Queens, Queens, New York census (dist 1181 img 12) as Charles Yandik age 28. Electrician, wiring. Father, mother born Austria. Found him on the 1920 Oyster Bay, Nassau, New York census (dist 7 img 14) as Charles Yandik age 38, manager, electrical supplies. Found him on the 1930 Sea Cliff, Nassau, New York census (dist 193 img 14) as Charles Yandik age 48. Contractor, electrical.